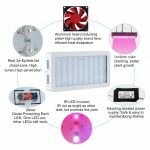 In front of you is the best review of the Philzon Newest 900W LED Grow Light you will ever see. We first listed some of the things we liked about this light and some of the things we didn’t like and then proceeded to a more detailed analysis of the product. 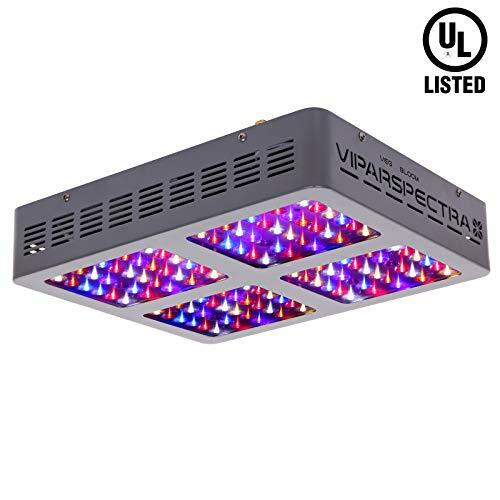 Furthermore, not only that we analyzed this excellent grow light, we also found the BEST POSSIBLE price for the unit so that you don’t have to dig around too much. Now, let’s see what this unit has to offer. We can’t deny that the Philzon Newest 900W LED Plant grow light is an excellent grow light. In fact, this might be one of our favorite grow lights in this price range. It does have a bit lower power output than the Viparspectra, but it also has a lower price. It’s perfect for 2 ft x 2 ft grow tents at 24 inches in height and it can take up to 6 plants from seed to harvest and it will do that with amazing results. What we loved the most about this light is an equal output of both red and blue light. 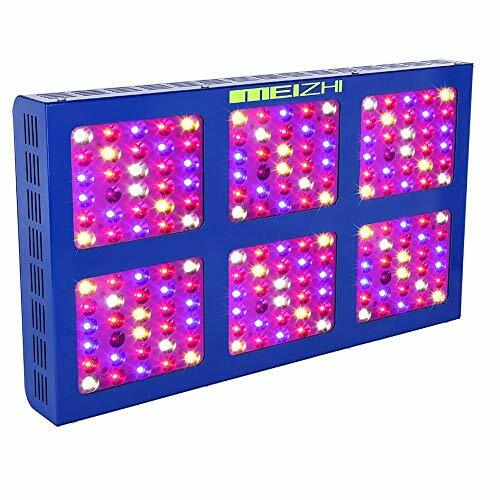 It has the high blue light output for the veg stage and high red light output for the flowering stage. Another great thing about it is the high PAR output. 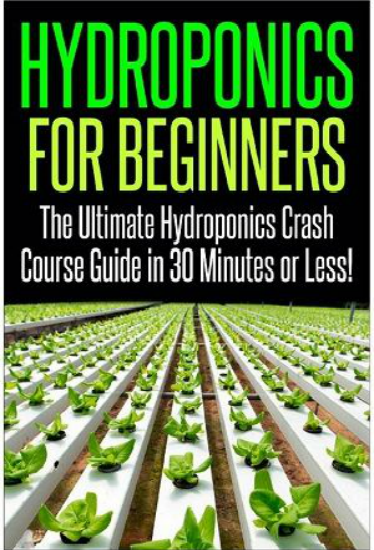 The PAR output is the part of the light that feeds your plant, and the high PAR output means that your plant will be well fed and it will produce big and potent buds. The only downside you can find is the popularity of this light which means it’s very often out of stock. If you’re still not convinced that this is the right light for you, proceed to a more detailed review below. NO REFLECTOR NO DANGER- Many others' grow lights are used led spotlight reflector to make the light look beautiful, but we don't use it because the led reflector is not heat-resistant. If a short circuit occurs，reflector at 80℃ is easy to melt and fire. we do not use the reflector, we can not give up the safety beause of beauty. FULL SPECTRUM- We did lots of experimentation to ensure that this full spectrum design promotes plant growth. It includes universal Blue Red IR UV and white light provide everything plant desire in the natural sunlight. 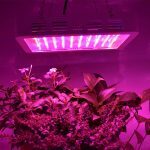 The expensive IR UV led promote plants to defense mechanisms, blue and red led is essential light for plant growth. 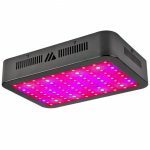 COMPARE TO HPS/MH- The 900W LED grow light can replace traditional 600 watt HPS/MH while consuming only 220 watts! More effective coverage area than any reflector series lights. perfect for a 2.5x2.5ft growing area at 24" height. The difference of us is that we use double cooling fans. Can most extend the light life. BEST SERVICE- We are a professional LED light manufacturer with strong R&D team and many light tester. 2 years warranty plus 30 days money back guarantee. If you have any problems, please feel free to contact us. We will provide you with completely satisfing reply. 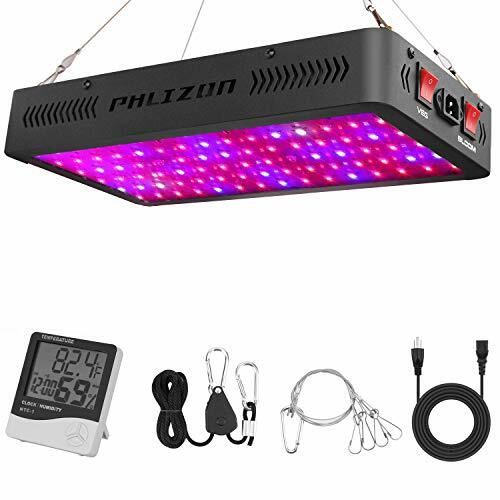 The Philzon Newest 900W LED Plant grow light has a lot of amazing features to offer such as full spectrum light and dual switches for each growth phase, affordable price, low heat levels, bonus items, etc. One of the best benefits of this light is the fact that it comes with everything you need to get started plus a few bonus items. You get the grow light, hanging kit with hooks, power cord, adjustable rope, and thermometer and humidity monitor. 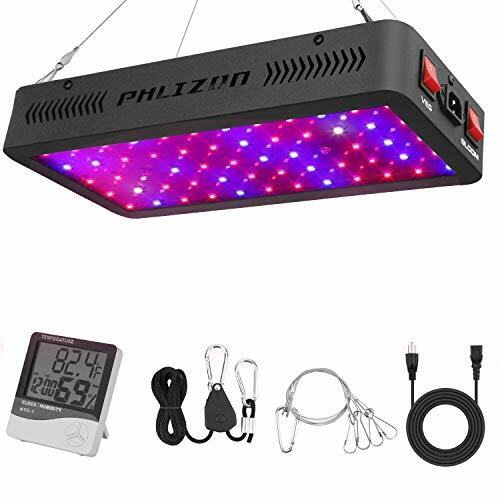 From the design of this particular grow light you can conclude that the Philzon takes the heat very seriously. The two fans on the top make sure that the heat stays at the highest point of the tent and there are also two side slots for the additional fans. A bit controversial decision was not to go with the reflectors on the LEDs. This does reduce the heat output but it also reduces the PAR value and wattage output. This is why this light can’t actually replace the 900w HID equivalent, but rather somewhere around 750W. This is still a pretty good wattage output and the light does stay cool. Now, the light does come with 600 watts of LEDs but it uses only around 108 watts, making it extremely energy efficient. Those are some serious energy savings. With the Philzon Newest 900W LED plant grow light you can be sure that your energy bills won’t surge while you grow your plants. 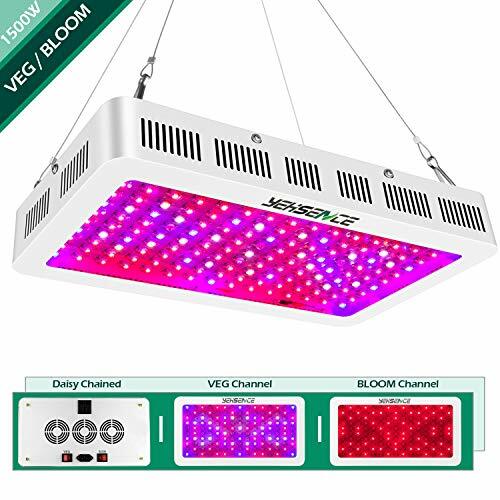 One of the greatest features on this grow light is the fact that you can daisy-chain multiple lights and you’ll only need one power chord to power them. Because of such a low price of this light, you can get multiple units for the price of a single more costly unit and cover a larger area and increase the PAR value by hanging three or four of these side by side. 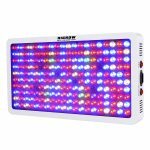 The Philzon Newest 900W LED Grow Light provides a full 12-band spectrum of light including the infrared and UV. 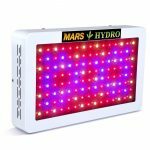 It also has dual switches for both growing and flowering phase so you can customize the light your plant receives at each point of its growth. Each switch provides the perfect wavelengths necessary to sustain your plant at that growth phase. When it comes to PAR value, if you hang the light at 24 inches, the PAR value at the center point will be 260 which is perfect for a clone or a seedling. Once your plant starts to grow you can move the light a bit closer. The closer you move the light the higher the PAR value will be. Just make sure that you watch for the signs of the light burn. This light generally covers an area of 3 ft x 3 ft at 24 inches but we recommend keeping the light at 6-12 inches from the plant during the flowering phase in which case it can cover 1.5 ft x 1.5 ft at best. 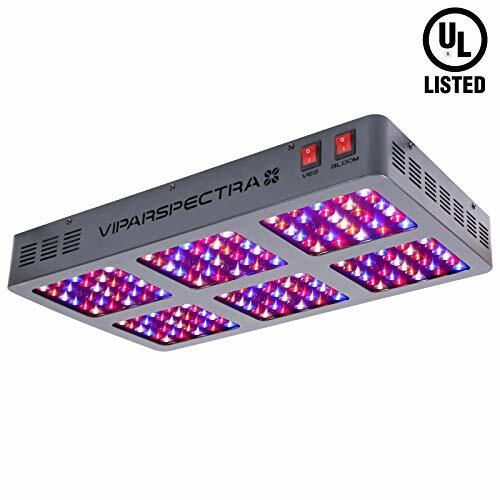 Since the good yield requires the higher PAR value, we highly recommend investing into 2 or 3 of these grow lights if your grow tent is bigger than 3 ft x 3 ft. 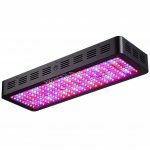 Overall, this is an excellent grow light for more than affordable price. Not only that the price is great but it also offers an excellent value for the price. The fact that you can buy more of these for the price of a single more costly light and that you can daisy chain more of these is a selling point in our opinion. Furthermore, you really don’t have to worry about the quality because the company is so confident that they give a 2-year warranty and they provide an excellent and very responsive customer service.